So Jeyakumar Devaraj of Parti Sosialis Malaysia has finally triumphed over S Samy Vellu. When I spoke to him early this morning, he sounded tired but happy. It had been a long, long struggle – more than nine years. “I think the victory was largely due to the nationwide swing to the opposition,” he said, modestly. I told him that that alone would not have been enough to unseat Samy Vellu, who once famously defeated the DAP titan P Patto in an epic battle. “It was your dedication, commitment to the cause and perseverance on behalf of the people over the years that saw you through,” I said. “I think that shone through, making it impossible for the people of Sungai Siput to ignore you. “Plus you had an incredible team of supporters who gave their all in campaigning for you.” He couldn’t argue with that. In one corner, you had Kumar, the soft-spoken respiratory physician who has sacrificed so much for the grassroots and marginalised communities. His quiet front belies a steely determination and passion for empowering the poor. Even the MMA recognised his commitment to society and awarded him a gold medal for community service many years ago. Kumar represents a multi-ethnic approach to politics; he sharply critiques the way the capitalist class are marginalising workers and other grassroots communities. Also an Aliran member, he had pointed out the flaws in Hindraf’s communal approach, which he said was misguided. Instead, he called for a broader multi-ethnic analysis of what was fuelling alienation, disenchantment and marginalisation. This broader world-view seems to have drawn support from the Indians, Malays and Chinese of Sungai Siput who voted for him in surprising numbers. Kumar, along with economist Charles Santiago, the new MP for Klang, will be a tremendous asset in Parliament in checking the trend towards neo-liberal economic policies while highlighting the huge gap between the rich and the poor of all ethnic groups. In the other corner, you had the flamboyant and eloquent Samy Vellu, the powerful MIC supremo, for whom funding for infrastructure projects was no problem. Samy Vellu is of course an integral part of the entrenched race-based system of politics, a keen supporter of the capitalist class. His ministry is responsible for awarding multi-million ringgit privatisation projects that generates huge profits for this class. Not to forget the Maika scandal that has dogged his every step for years – until the Hindraf protests exploded into a cacophony of boos and jeers that greeted him wherever he ventured outside Sungai Siput. It was in Penang – ground zero of the political quake – that the jeers were first heard in the Penang International Sports Arena, as reported in this blog earlier. I can’t say I knew Samy Vellu personally. But my late grand-aunt, Anna, was his teacher in Batu Arang, once a prosperous mining town in Selangor where the young Samy grew up in the 1940s and worked as an office boy. 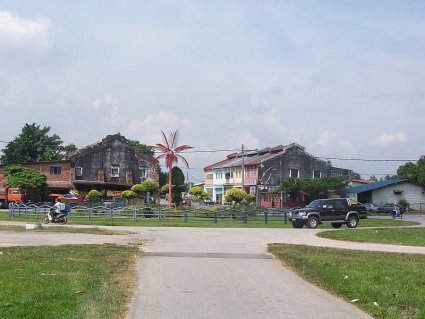 The Batu Arang English School was actually set up by the coal-mining company. Samy’s parents, who were both rubber tappers, eventually settled in Batu Arang, where his father worked in the coal mine. 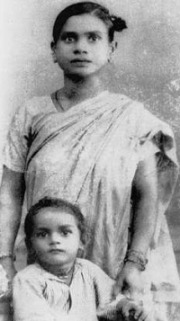 The young Samy (Left: Samy Vellu and his mother) would have been familiar with the huge open mines into which lorries would descend until they appeared to be the same size as matchboxes to those standing at ground level. I took a trip down memory lane to Batu Arang during the Lunar New Year holidays. The old school is still there; so is the school field. It is all lush and green today. It was not all green in those days. The British burned down the jungle foliage on both sides of the approach road to Batu Arang because they were afraid the communists would lie in wait to ambush them – so the roadsides were all brown and dry. Back then, a visitor to Batu Arang would have been greeted with the smell of burnt coal and some parents including Anna would fret about the effect the pollution would have on their children’s health. Others worried whether the tunnels deep beneath the earth would collapse. Today, the deep open mines are filled with water and resemble picturesque lakes. Small groups of Indian Malaysian young men gather to chit-chat on the grass by the lake with little piles of crushed beer cans near them evidence of their ‘liquid’ picnic. Grand-aunt Anna, whom I called Amma, would reminisce with me: “Even in those days, Samy had the gift of the gab.” Indeed, Samy would go on to become a Tamil drama actor, a news-reader and eventually a political boss who is not exactly reticent or tongue-tied. 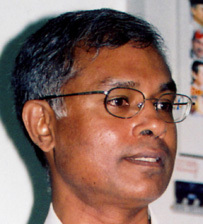 In fact, he is regarded as one of the best orators in the Tamil language in Malaysia today. I can’t say Amma was terribly impressed with Samy and how he had turned out, though. She had a habit of speaking her mind and didn’t suffer fools gladly. She was also aware of the Maika scandal. Still, she was bemused by the great respect he had for his former teachers. Some years ago, when she was arriving at a wedding reception for one of Samy Vellu’s relatives, the MIC president spotted her entering the hall. He immediately yelled excitedly to his brother, “Palani, teacher varuthe (teacher has come)!” (S Palanivelu passed away last year after a heart attack.) Whereupon both of them raced up to pay their respects to her. “Dei, naalkaali kondu va! (Get her a chair! )” Samy ordered one of his aides. I also bumped into another retired Batu Arang School teacher, in his late seventies or eighties, who described to me the young Samy’s tenacity. Now this teacher had a beautiful Triumph motorbike when he was in Batu Arang, which he parked by the road one day. As he watched from a distance, he noticed the young Samy Vellu walking up to admire the bike. Time passed, and one day, as this teacher was out driving, he spotted a young man vrooming past him on a Triumph bike. It was Samy who had got or borrowed a bike of his own! “You see how tenacious and determined he was?” the former teacher mused. Samy Vellu’s perseverance saw him taking evening classes to become a draughtsman and he eventually went to the UK to study architecture. If you are interested, you can actually see his name listed on the website of the Royal Institute of British Architects. Why am I telling you all this? Just to say that Samy Vellu had humble beginnings but through sheer perseverance, tenacity and who-knows-what-else worked his way to the top. No one denies he has helped some Indian Malaysians with infrastructure and scholarships etc – but like the rest of us, Samy had choices to make along the way: Would he offer them the spoils or the scraps? Where would the spoils really go? Would he really address the root causes of their sense of disempowerment or would he just offer band-aid solutions and cash handouts to address their immediate problems? Could he – would he – have done more, a lot more, to empower the dispossessed? Or would he be more interested in serving the elite capitalist class? And should he have known when to quit, on his own terms, before the writing was on the wall? In the end, he slunk into anonymity, a sad, solitary figure who will have much soul-searching to do during his retirement. Denison Jayasooria says Samy and MIC helped indians. If MIC helped indians why are we faced with the sorry statictics such as highest crime rate among indians, unemployment , poverty, etc.? My opinion is that MIC should be dissolved and indian interests should be represented by the indian members of parliament now. 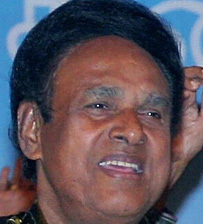 The oppositon parties have given us more indian parlimentarians than the MIC did in the last 20 years under Samy Vellu. he must face the court for maika . the problem is he got away because of the powers that be and the … judiciary. he must face and be givenb his dues for making so many of us to face sheer hardship ,loss of investment and misery. he ought not be let go scot free. i hope people like him wont repeat his ways after seeing his end. I am gathering further info on him – and I will be following him. I will keep you posted further developments. It is a great victory for the people of Malaysia. As an ex-Malaysian, I am please to see the great courage of the Malaysians who voted the change for a better future. I do hope that the opposition will work together and do their best to fight for justice, freedom and rights and remember that the government is form of the people, by the people and for the people. It great to see or hear a strong influence leader falling down the election.From here we could see the people in Sungai Siput have showed to all malaysian ” people power” is much needed to bring all the corrupt leaders back to where the came from. It also a lesson to all the leaders in other party that “People Power ” is much more powerful than government . His defeat was expected long time ago. He should have stepped down for this general election. Everybody starts to hate ready to the max. It is a clear democracy result. He should keep his mouth shut as he was talking too much lately. It is very that the whole indian community didnt want him to lead. We were given empty promises. He should step down and he should take responsibility for the heavy defeats of MIC in the last general election. SO it is better to leave honourly rather than a shameful exit. the story of Samy’s rise and fall is a lesson for all the newly elected. my hope and prayer is that the barisan rakyat will not let their victory go to their head, and that they will remember why they were voted in. while i am happy for Kumar’s win and what that might mean for the indian community, i am convinced that our future lies in a multi-ethnic, plural and secular society. it’s a delicate tension balancing the needs of an ethnic community against the bigger picture of a malaysian malaysia. is that dream possible? Hindraf has proved itself. Vaalga indians. Great post on the “Great Leader” and the coverage of the election. Thank You! About Time the Malaysian People woke up and fought the Goood Fight,Never Give Up. No Matter how futile it seems. Don’t forget that Samy may still be made a Senator and Minister even in defeat. The BN cannot afford to ignore the leadership of MIC or any other component party leader who has been defeated, otherwise we could very well end up with an almost all-UMNO cabinet, not that it will make much difference. I just started to read you blog yesterday.. I must say I really love your direct no nonsense approach towards politics issues. As for Samy, I couldn’t agree more with WoodyOoi’s comment on passing on the baton to the next successor. One could have done a lot as a leader but consider a failure if Success without a successor. That was a very good post and I enjoyed reading it! Yes, Samy Vellu has helped our Malaysian Indian community in the past, there’s no doubt about that. I guess he spent too much time with the upper class of the community and overlooked the needs and concerns of the people down under. So long Samy.. You made the right wrong choice and now you got what you deserved.